No one wants this to happen. 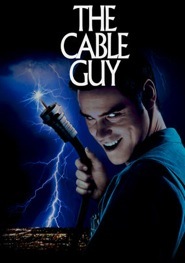 I don’t think I’m going out on a limb here to say Cable Guy was not a good movie. And having a Jim Carrey-esque worker show up to your home in real life and get all up in your face and pushy? That’s downright terrifying. Some Seattle residents are claiming Comcast contract workers are going too far and totally freaking out potential customers with their overly aggressive ways. KING 5 News says residents of the Capitol Hill neighborhood have been complaining to Comcast that they’re feeling threatened by workers who just won’t let up. “It was just a lot of adrenaline at the time,” one woman said, after two workers appeared at her front door on Friday night. “They said they were contractors for Comcast and had the authority to be there and showed me this card and I mean, I’ve got a deck of cards, I can pull out the queen but I’m not royalty.” Zing! They finally left, only to return later and continue being creepy. “One of them smiled at me and said, ‘Are the police on their way ma’am?’” she said. Of course, she reported this yucky behavior to Comcast and took to Twitter to vent about the situation as well. A fellow resident read about her experience and said something similar happened to him. Workers showed up, didn’t try to sell him on anything but insisted he open his door. He did not comply. Comcast says the behavior is unacceptable, but because the workers were contractors, it could be hard to difficult out who they are. On behalf of Comcast, I want to offer my apologies to our customers. We are taking these complaints very seriously. As a policy, we do not tolerate overly aggressive, inappropriate behavior from the door to door sales people employed directly by Comcast or by our contractor companies and will take steps to ensure that incidents like this do not happen again. If anyone witnesses unacceptable behavior from any door to door sales person representing Comcast, we encourage you to call 1-800-COMCAST to lodge a complaint. Thanks for setting a creepy precedent, Jim Carrey. Thanks a lot.